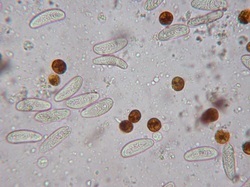 After treatment of corals suffering from BJS with Metronidazole (by Dr William Wildgoose), the ciliate's were observed to die off and be completely absent (see picture of brown jelly with no ciliate's present). If the corals survive remains to be known, it is likely treatment such as this will work if you catch the disease early enough. If the coral is to far gone and the disease to wide spread fragmentation and isolation are still the best bet.